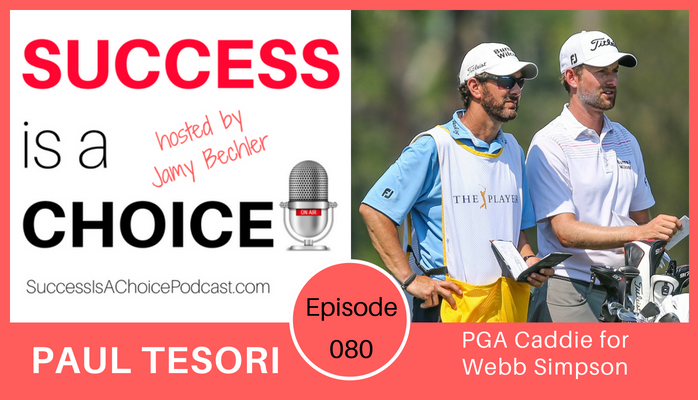 Paul Tesori, a Championship PGA caddie and the co-founder of the Tesori Family Foundation, was featured on the July 16 episode of the Success Is A Choice podcast. During the 35-minute show, Tesori talked about the life of a caddie and the great relationship he has with Webb Simpson. He also shared some of the positive impact that his charity is having as they do great work to help others in need. The specific page link to view show notes and listen to the episode is at www.JamyBechler.com/PaulTesori. The Success Is A Choice podcast is hosted by Jamy Bechler and brings together thought-leaders in various industries to share their experiences and insights on success. Previous guests have included Dwane Casey, the 2018 NBA Coach of the Year; Kevin Harrington, the original shark on “Shark Tank”; Pat Williams, co-founder and Senior VP of the Orlando Magic, and Michael Catt, pastor/producer of the films “Facing the Giants”, “Fireproof”, and “Courageous” to name a few. The host of the show, Jamy Bechler, is a former college basketball coach and athletic director turned motivational speaker and leadership consultant. He works with organizations and businesses throughout the country, including those from the Big 10 and the NBA. Bechler is also the author of six eBooks and has published two books including The Leadership Playbook: Become Your Team’s Most Valuable Leader, which was a #1 new release on Amazon for basketball coaching books. You can see all episodes of the podcast by visiting www.SuccessIsAChoicePodcast.com. Podcast episodes are available on iTunes, Stitcher, Tunein, Google Play, and Soundcloud. Tesori appears in episode #80. You can learn more about Paul Tesori and the great work that the Tesori Family Foundation is doing by visiting www.TesoriFamilyFoundation.org.